I know we missed the Giveaway roundup yesterday and that many of you always look forward to that post. However, we've been a little short on time this week as we've had a lot of errands to run and my parents came back through yesterday and are staying for the weekend. So to make it up to you, instead of a roundup we thought we'd just giveaway some stuff ourselves. We've been so fortunate here lately, and with baby on the way we've been busy cleaning things out and tidying up the house. Don't worry, we're not giving away anything old or used. That would be gross "bleck!" Anyway, the past couple of giveaways have been, for the most, part generic meaning both guys and gals could use them. This time around we have two items up for grabs. One with the men in mind (of course the ladies may want these as well) and one with the girls in mind (if a man wants this, I'd seriously question his manliness). Unless, of course he's trying to win it for a lady friend, which would be okay. However, to avoid any weird ideas from floating around in our heads about you, you might want to disclose that in the comment that is required to win. So for the good stuff, the prizes! 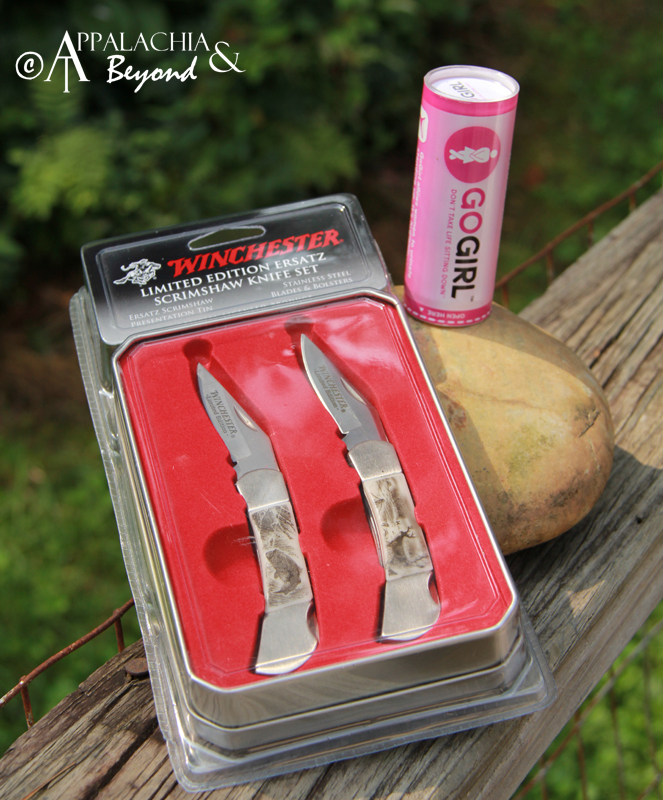 We have for you, our readers, a chance to win either a GoGirl (which Robin reviewed last week), or a pair of Winchester Limited Edition Ersatz Scrimshaw knives. To win, leave a comment on the post stating which prize you'd like to enter for. Only one prize per entrant so be sure you choose the one you really want. To the men out there who comment they want to win the GoGirl , please let us know who it is you are hoping to win this for (i.e. wife, daughter, girlfriend, etc.). 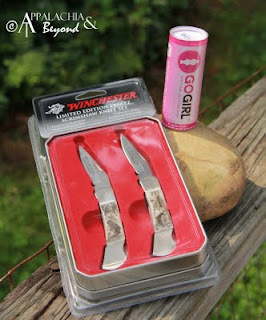 The GoGirl is of the lavender color just like the one Robin has and reviewed on the blog last week. The knives, as stated above is a set of two Limited Edition Erastz Scrimshaw Winchester knives complete in Presentation Tin. They are stainless steel fold and lock pocket knives, great for your collection or to carry with you on the trail. There you have it. Two great items for two lucky readers. We will run the contest for one week. Make sure to have your comments in by 11:59pm EST on Saturday, July 30. We will pick and announce two lucky winners on Sunday, July 31 via the wonderfully spiffy Random Number Generator from www.random.org. P.S. Don't forget about the ENO giveaway at Outdoor Informer and the pocket chainsaw giveaway at PAHikes.com. Both of these end on July 31st. Also, Tom and Atticus are at it again with another collar giveaway from Lupine Leads and Collars. Tell Tom and Atticus how your pet beats the heat on the giveaway photo post on their Facebook Page before 9:00am EST Monday July 25 to enter. 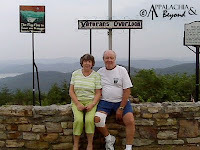 Finally, the Daily Hiker has an awesome High Peak backpack they are giving away. Check out their post for all the details.